I’m finally posting a recipe that so many of you have requested over the years! When I lived in Korea, this type of chicken was called yangnyeom-tongdak. As I mentioned in the video, yangnyeom means “seasoned” and tongdak means “a whole chicken.” Traditionally a small whole chicken was cut into chunks, coated in batter or dried ingredients, fried, and mixed with a sweet, sour, and spicy sauce. We used to order a half or whole chicken from one of the yangnyeom-tongdak places in my neighborhood. Fresh, hot yangnyeom-tongdak would be delivered to my home in 30 minutes! One day I went in for takeout and had a chance to watch the owner making the chicken for me. My eyes burned into his hands as I watched. He used garlic, tomato ketchup, sugar, and hot pepper paste! I always preferred my dakgangjeong to yangnyeom-tongdak, and whenever I had a party, event, or wanted to surprise people, I made dakgangjeong because everybody loved it and was curious about the recipe. So when I posted the recipe on YouTube, I was very happy to hear that so many people made it and let me know it was a big hit. So far it’s been watched 292,931 times on YouTube. A yangnyeom-tongdak place was on every corner in Korea when I lived there. All of them tasted similar, the only difference between this place or that place came down to 3 elements: batter mix, the ratio of dried ingredients, and the sauce. Many entrepreneurs created their own recipes to avoid paying high fees to a well-known franchises. After I left Korea, I’m sure many more places have sprung up, each with their own recipe. In the “recipe request” section on the forum on my website, how many people have requested this type of chicken dish? Yes, so many! Some people emailed me, too! Kyochon Chicken, Bonchon Chicken … I can tell you that they’re all very similar, the only differences being those 3 elements that I mentioned. Enjoy the recipe and I will let you know if I ever invent a better one. *tip: You could use chicken wings, too. About 24 wings will be 3 pounds. Add 1 ts ground black pepper and 1 ts kosher salt. Add ½ cup potato starch powder, ¼ cup all-purpose flour, ¼ cup sweet rice flour, 1 ts baking soda, and 1 egg. Take them out of the oil and shake them off in a strainer. Let them sit for a few minutes. *tip: If your skillet is not large enough to fry all the chicken at once, divide it into batches like I do in the video. Add ⅓ cup tomato ketchup, ⅓ cup rice syrup, ¼ cup hot pepper paste, 1 tbs apple vinegar and simmer the mixture for about about 7 minutes. Keep your heat low and be sure not to burn the sauce. Turn off the heat and wait until the chicken is done. Posted on Thursday, January 27th, 2011 at 1:07 pm. Last updated on February 2, 2017. Posted September 2nd, 2018 at 5:52 am | Log in to reply. Hey Maangchi! I’m planning on making this soon and wanted to know how I can add ddeok to it. When I lived in Korea, I used to go to the local chicken shop and get Yangnyeom with ddeok! It was crunchy on the outside and chewy in the middle, could I fry it, then add it to the chicken and sauce? Posted August 27th, 2018 at 11:16 pm | Log in to reply. I never use ketchup because I find it unnecessarily overly sweet and kept avoiding this dish because all recipes seemed to use it. Hoping for best, I skipped the rice syrup and added hot pepper flakes using your video with FIrstWeFeast and it had a delicious balance of savory, spicy, and sweet. Posted July 15th, 2018 at 10:52 pm | Log in to reply. Thank you so much for this recipe, Maangchi! Your recipes are always amazing and bring so much happiness to our family. As someone diagnosed with Celiac disease, I make modifications with gluten-free flour instead of regular flour. 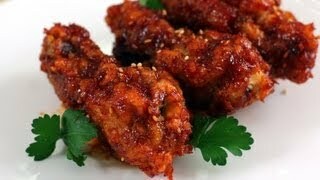 This has allowed me to eat delicious Korean fried chicken at home! Posted July 13th, 2018 at 12:38 pm | Log in to reply. I made this for my family yesterday and they loved it (it was spicy for them but perfect for me hehe) Thank you Maangchi! Posted July 19th, 2018 at 8:18 am | Log in to reply. It looks great! And a great photo, too! Posted May 8th, 2018 at 5:14 pm | Log in to reply. Hi, I have combined this and your other way to make Korean chicken. I have used corn starch and an egg and it worked brilliantly. Love Korean food. Love at first bite. Posted February 19th, 2018 at 1:54 pm | Log in to reply. Do you think I could make this in an airfryer? I can’t eat foods fried in oil anymore but I love this dish! Posted February 13th, 2018 at 1:54 am | Log in to reply. This recipe is so yummy! I’ve made it twice and loved it! Mine turned out so good. Posted February 17th, 2018 at 1:49 pm | Log in to reply. Yes, I agree with you, your yangnyeom-tongdak looks the best! Posted January 29th, 2018 at 8:09 pm | Log in to reply. Posted January 22nd, 2018 at 12:19 pm | Log in to reply. I made this one last week: it´s really super deliciousss! Only added a tsp. of minced ginger to the sauce: that made it perfect! Posted September 7th, 2017 at 12:23 am | Log in to reply. Posted September 14th, 2017 at 8:42 am | Log in to reply. Sweet rice flour makes it a little more chewy, which is why I use it in this recipe. Posted September 1st, 2017 at 1:19 am | Log in to reply. Hi Maangchi, If I wanted to make the sauce just a bit more spicy, what would be the best way? Thanks! Posted September 13th, 2017 at 10:05 pm | Log in to reply. Posted September 14th, 2017 at 1:46 am | Log in to reply. Hi Maangchi! Thanks for the advice! I was also thinking of maybe adding a bit of gochugaru to the sauce, but this is maybe a better idea. Also, one more question, would it be possible to make the sauce a day in advance and keep chilled? Or at least mix all sauce ingredients beforehand and bake them later (at a different location)? I’ve already made your recipe SO many times and everyone, literally everyone is crazy about it. Posted August 2nd, 2017 at 3:20 pm | Log in to reply. Hi Maangchi! I really love your recipes and I want to try this one, but I have no way of getting hot chilli paste or some of the ingredients to make it. Is there any other ingredient I can use instead? Thank you!!!! This recipe was originally posted on January 27, 2011 at 1:07 pm by Maangchi. It was last updated on February 2, 2017. The video was watched 5,060,551 times on YouTube & has 43,436 likes!